My reaction to tuna casserole used to be one of indifference. I didn’t hate it and would eat it, but it wasn’t something that I ever craved. I remember my mom making Tuna Helper when I was a kid. I never cared for it though and as an adult didn’t buy it to make for my family. My outlook on tuna casserole changed after trying this recipe a few years ago. A friend of mine suggested I use chip dip as the sauce. It worked out beautifully! Since then, this is how I’ve been making my tuna casserole. No box mixes here! When you are mixing up the tuna noodle mixture, it will look like you have a lot of dip in there. You do, BUT it will soak into the noodles during cooking. I’ve tried it with one tub of dip and found it wasn’t enough. The topping is my fave, cornflake crumbs! I buy them in a box already crushed. You could also crush Cornflakes yourself or use breadcrumbs instead. You might also like this 5 Soup Pasta. What do you add to your tuna casserole? Creamy noodles topped with a crunchy cheesy topping. Chip dip is the secret ingredient! Preheat oven to 375F. Grease a 9 inch baking dish and set aside. Stir together noodles, tuna, dip and season with salt and pepper. Spread noodle mixture in the baking dish. In a separate bowl, mix together Cornflake crumbs, butter and cheese. Spread evenly over noodle mixture. Bake for 25 to 30 minutes or until topping is browned. This looks delicious, I would have to add some vegetables to this. Thank you for sharing this recipe. Wow- very simple recipe and idea! Hadn’t thought about tuna casserole in years! What an interesting idea – adding in the sour cream-based dip. I have to try this recipe. I haven’t had tuna noodle casserole in ages. This sounds like a delicious version. Thanks for sharing! Love tuna casserole, thank you for this recipe! What a delicious sounding version of tuna casserole! My family would love this. I’m looking forward to trying it soon. I’m not a fan of tuna, but hubby and jr. are and they would devour this if I made it. Love the use of cornflakes instead of bread crumbs. Not a tuna fan here but I will share it with friends/family that are, it does sound interesting. Hmmmmm, different and interesting, a nice change though using dip, I must try this one out! This looks like a great recipe. I love tuna casserole, and the addition of corn chips for crunch sounds really good. Thanks for sharing. Yours looks delicious! I liike tuna cassorole but have never ever ade it- my husband detests it and refuses to even taste it. 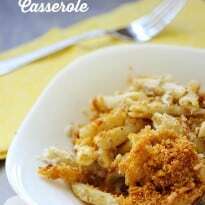 Like you I had Tuna Helper and wasnt a fan but I love going to potlucks and having the tuna cassarole. Yum! Maybe I can get the 5year old to eat this!! I love tuna but I gave it up a few years ago…boycotting canned goods. I do miss it though and will keep this wonderful recipe in mind for that day when the BPA comes out of can linings. I love that this is so easy to make! Good recipe for the upcoming cold weather. Sounds like a simple, appetizing and nutritious recipe. I am not a big tuna fan unless it’s a cold dish.However since I love all the recipes that you post I am giving it a try at least once.It actually looks delicious in the photo. This looks like a really awesome recipe to make! I would love to have this recipe for a Sunday Dinner. It looks so delicious! I like this recipe. I’d add some peas. I have never liked Warm Tuna and My Husband mother makes something like this but puts crushed up Potatoe chips on her’s! So I used canned Chicken! Fab the whole house liked it and My house didn’t smell like Tuna! I recall that my nannie (grandmother) made tuna casserole with potato chips, peas and mushroom soup. It was very good. Quite often, I make a tuna casserole with tuna helper. I don’t mind it. It’s quick and I don’t mind the taste. 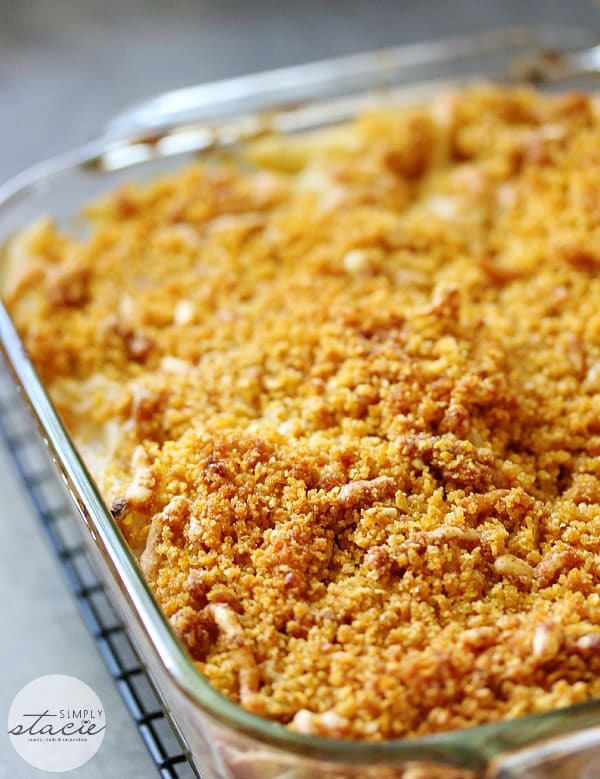 I have never tried making a tuna casserole with the ingredients you use (sour cream based dip, swiss cheese and cornflake crumbs) but I think it would taste good and I look forward to trying it. Thanks for sharing this recipe with your readers. I had leftover salmon so I used that instead of tuna and it was delish ! Looks really delicious! I’m not a fan of tuna warmed up but this looks really delicious! Thank you for the info. We love tuna. So pick about tuna. I like tuna casserole and tuna salad. That is it. I am going to make this sometime this fall. Looks yummy. This looks very delicious and comforting, so I might have to try it for supper. This sounds very good will have to try it some time. Tuna casserole is one of those things we have never tired of though, like you, I have tried to spice it up a little bit by adding this or that ingredient. One of the things that I like mixed with it is spinach. Wow I could even make this! I want to try this for my grandsons. I think they would love this! When I grew up, there wasn’t Tuna Helper at the stores yet, so my mother made Tuna Noodle Casserole from scratch. I loved it! Lot’s of cheesy goodness and vegetables and she always topped it with crushed potato chips! This sounds really good. 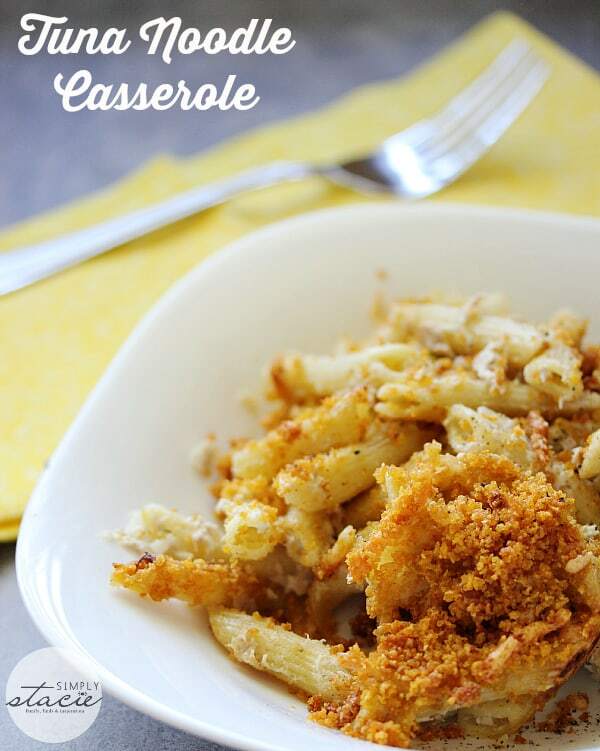 My kids love macaroni and tuna so this should be a great hit with them. Linda Bradshaw , teachinmomma123abc at yahoo dot com.